The first step in the foreclosure process is called pre-foreclosure. When a homeowner has not paid their mortgage for more than ninety days the bank that owns the mortgage on that property files what is called a “lis pendens” which means “suit pending” in Latin. A “lis pendens” is a written public notice that a lawsuit has been filed concerning real estate. This notice is filed in the county public records against a piece of property. This notice is also often listed in the classified ad legal section of certain newspapers. Filing this public notice alerts any potential purchaser or lender that the title to this property is “clouded” or unclear. When a property has a “clouded” title then the title is not “free and clear” which makes the property less attractive to potential buyers or lenders. In reality, once a “lis pendens” is filed, a property cannot be sold or refinanced without the buyer being fully aware of the fact that the “lis pendens” has been filed. The only way to get rid of a “lis pendens” is through foreclosure which wipes out a “lis pendens“. Once a lis pendens has been filed the property is considered to be in pre-foreclosure. If you subscribe to a public database like www.foreclosures.com, www.realtytrac.com and many other similar sites you can get access to the properties that are in pre-foreclosure. You can also get a list directly from your county clerk by visiting your county courthouse. In some counties these lists are even available online. If you are investing in pre-foreclosures you are buying a house directly from the homeowner. This negotiation with the homeowner is usually done without the banks knowledge. If you are investing in pre-foreclosures you will need to negotiate directly with the homeowner about purchasing their house. Since the “lis pendens” filing is public knowledge investing in pre-foreclosures is very competitive. If the house has no equity then you will need to negotiate a short sale with the bank. A short sale is where a bank agrees to take less than the full amount owed to them. This occurs when a buyer is only willing to purchase the property for less than the amount owed on the mortgage by the seller. In the case of a short sale, the bank is aware of the process since you will need to negotiate with them. The department at the bank that is responsible for negotiating short sales is called “loss mitigation”. There are numerous online sources of pre-foreclosure lists which make the barrier to entry in pre-foreclosure investing very minimal. Anyone can become a pre-foreclosure investor simply buy purchasing a list of homeowners in foreclosure. Since the information is public record it can even be obtained for free by visiting your county courthouse. For this reason, pre-foreclosure investing is fiercely competitive. Since there are so many potential pre-foreclosure investors, the homeowners in foreclosure are literally bombarded with offers to purchase their homes. This makes it difficult for investors to differentiate themselves from one another to the homeowner. Additionally there is often hostility and anger from the homeowner since they do not want to be bothered by “foreclosure sharks” or people that they perceive as trying to take advantage of their situation. For the above reasons, pre-foreclosure investing is a difficult and competitive area of foreclosure investing. If the homeowner cannot do a loan modification or sell their house to an investor then the house goes to the foreclosure auction. The foreclosure auction is a public auction that allows any member of the public to bid on a house. Typically you need to register prior to the day of the auction and you need to have a cashiers’ check made payable to the clerk of the court for at least 5% of the purchase price. 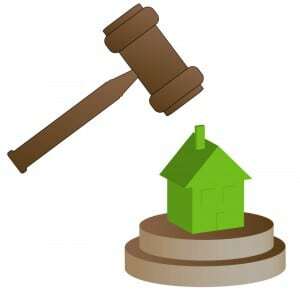 If you bid on a house and win the auction you are expected to pay the balance of the amount either later that day or within 24 hours. In the event that you do not pay the balance in time then in most counties you forfeit your deposit. You cannot get a mortgage to buy a property at the foreclosure auction. You need to have the ability to pay cash for a property and you need to be able to produce both the deposit amount and the full amount within no more than 24 hours after the auction. Since so much cash is required, investing in foreclosures by buying at the courthouse is difficult for new investors. Investing at the courthouse is also full of risks. When you buy a house at the courthouse you do not get free and clear title. You get a property as is. If there are liens, judgments or code violations recorded against the property then these will not be wiped out by the foreclosure auction. If your property has squatters or unwanted tenants you will need to go through the eviction process prior to even entering your property. In most cases there is no inspection of properties sold at the courthouse so any damages that there might be are your responsibility. You also might purchase a property only to find out later that all the cabinets, appliances, and fixtures have been stolen out of the property. In some cases beginners at the courthouse are not even aware that they are not bidding on a first mortgage. I have seen bidders bidding on a second mortgage only to find out that there is a first mortgage ahead of them. If you are going to be investing in foreclosures by buying them at the courthouse it is imperative that you understand “position” and which mortgage you are bidding on. It is also imperative to do a very thorough title, lien, utility and code violation search. It is also important to do your homework in understanding the condition of the property, the value of the property and the estimated repairs that the property will need. Investing in foreclosures at the courthouse is not for the faint of heart and certainly not for beginners. You need to be very knowledgeable about real estate law, the foreclosure process, and have access to a good title agent that will run title searches for you. Since buying at the courthouse requires cash it has a high barrier to entry. Anyone without access to cash cannot buy at the courthouse. This effectively eliminates a lot of the competition. If you are willing to be diligent and do the work, buying at the courthouse can be very rewarding. However this is not an area for beginners. Anyone can watch a foreclosure auction by going to the courthouse on the day of an auction. You do not need to be a bidder to enter the room where the auction is being held. Buying at the courthouse can be frustrating since foreclosure auctions are often cancelled at the last minute. Auctions can be cancelled because one or both of the parties was not served correctly, the seller has filed bankruptcy or the seller has negotiated a loan modification with the bank. Doing a lot of research on properties and then watching them get cancelled at the last minute can be very time consuming and frustrating. Usually the bank is prepared to let a property get sold at the courthouse for eighty to ninety percent of its market value. Depending on economic times, this number can be higher or lower. The attorney representing the bank will protect the banks interest by bidding up to the value of the amount that they are willing to sell their property for. It is a myth that foreclosures get sold at the courthouse for pennies on the dollar. In reality, the bank will protect their interest up to almost the full amount that is owed to them. This is another reason why bidding can be very frustrating at the courthouse. If the bank is the highest bidder, then the property goes back to the bank and becomes a bank owned or REO property. Real estate owned or REO properties are properties that are owned by the bank. Since banks are not landlords the first thing that they do with a property that comes back to them is they try and sell it. The way that they do this is by using “asset managers” or asset management companies which are companies that represent the banks in dealing with their REO properties. These asset managers submit their REO properties to pre-established realtors that only work with REO properties. These realtors give their asset managers a “brokers’ price opinion” (BPO) which lets the bank know at what price the realtor thinks the house should be listed. Usually bank owned properties are listed at competitive prices in order to facilitate a quick sale. REO properties are cash only deals meaning any potential buyer needs to be pre-qualified by the bank and needs to show a “proof of funds” like a bank statement. Buyers need to show that they have the cash available to purchase a property. Buying REO properties is not as competitive as pre-foreclosures but is more competitive than buying at the courthouse. The reason is because all of the properties are listed on the multiple listing service (MLS) so any member of the general public can have access to REO properties through websites like www.realtor.com and www.zillow.com. This makes purchasing REO properties fairly competitive although the barrier to entry is high since you need to be a cash buyer. You cannot get a mortgage to buy a property that is owned by a bank. In fact if a bank is faced with two offers they will always take the cash offer even if it is substantially lower than any other offer. The reason is because banks need to liquidate REO properties quickly in order to avoid a bottleneck of owning too many properties. Federal regulations limit how many bad loans a bank can have on their balance sheet so banks try and get rid of their REO properties as quickly as they can. For this reason, cash buyers that are prepared to close quickly and waive contingencies like inspections will always get the best deals. One big advantage of purchasing REO properties is a relatively free and clear title. I use the word relatively since the banks use their own title companies to close on their REO properties. Sometimes these title companies do not search for code enforcement and utility bill liens. However the marketability of the title is never in question. The popularity of purchasing REO properties changes depending on the current state of the real estate market. Presently the best opportunity for buying foreclosed properties is with REO properties. In some situations these houses are being sold at ridiculously cheap prices. Since there is so much turmoil in the banking sector many banks are reluctantly being forced to “dump” properties at very low prices. If you have the cash to invest you should begin looking for an REO bargain while they are still available. It is estimated that there is enough supply still entering the market that you can probably purchase an REO property relatively cheaply and easily over the next two years. For patient long term real estate investors this is an excellent time to be buying real estate.